On Tuesday, Senator Cindy Hyde-Smith won a hard-fought runoff election over her Democratic opponent, Mike Espy. That Mississippi is sending a Republican back to Washington is hardly a surprise, but Ms. Hyde-Smith gave the opposition hope in the closing weeks of the campaign as she careened from one gaffe to the next — each one emphasizing both that she was tone deaf and that she found humor in her state’s history of racial violence and voter suppression. Racist violence, segregation and voter suppression are not shared historical jokes. They are our present. Unless we change course, they will define our future. Ms. Hyde-Smith claims not to have realized there was anything wrong with what she said. She has steadfastly refused to apologize. Perhaps most important, since her comments came to light, she has yet to publicly engage in conversation with constituents of hers for whom hanging is not a joke and voting is a hard-fought, continually challenged right. During the campaign, she did not acknowledge there was even a dialogue worth having. Perhaps this is because for much of her life she has been hearing only one side of an argument and doesn’t know or care that there is a larger conversation to be had. If this is the case, it may have something to do with where Ms. Hyde-Smith went to school and where she chose to send her daughter to school. It was only a few days ago that we learned not only that Ms. Hyde-Smith had attended and graduated from a now closed, whites-only segregation academy called the Lawrence County Academy but also that she had chosen to send her daughter to Brookhaven Academy, which shared the same founding history. And as late as 2016, it had managed to maintain a strikingly white racial makeup, with one black child and five Latino children attending a school with 386 pupils in a town that is 54 percent black. The most notable thing about the South’s segregation academies isn’t that they were racially segregated. Racially and economically segregated schools remain across all parts of the United States. What is notable is that taxpayer dollars financed these all-white schools at the cost of simultaneously creating poorly funded all-black public-school systems in the South. To put it simply, as the financial drain of taxpayer dollars from whites attending segregation academies decimated school systems educating black children, black communities, students and teachers paid a terribly high price to ensure that whites were educated with other whites. [S]egregation academies were a private school concept adopted in Mississippi and found across the South in the decade following the Brown v. Board of Education decision. They were conceived as a way to permit white parents to avoid sending their children to schools with black students and a legal way to work around the Brown decision, which did not apply to private schools. These funding schemes were so successful that by 1970, roughly 300,000 students were enrolled in all-white private schools across 11 Southern states, and by 1974, 3,500 academies enrolled 750,000 white children. In Jackson, Miss., alone, white enrollment in the public schools fell by 12,000 students, going from representing more than half of the student body in 1969 to less than a third in 1976. That demographic shift caused a drastic reduction in the funds available to educate the predominantly black children left behind, as tax dollars earmarked for their educations followed white children both to quasi-private segregation academies or to still segregated white public schools. For their part, black parents fought back using the legal system to file hundreds of lawsuits arguing for educational access and equal funding, but many also acquiesced. Terror campaigns, both economic and physical, convinced them it was in their best interest to “choose” to stay in underfunded, segregated schools. Those who attempted to enroll in all-white public schools were subjected to numerous forms of both physical and economic intimidation — job loss, eviction, threatening phone calls and physical attacks. That is part of the educational history of the defeated Democratic candidate in the race for the Senate in Mississippi, Mike Espy, who integrated Yazoo City High School in 1969. Mr. Espy attended a parochial school through his first two years of high school, then it closed and he enrolled at Yazoo City High School. He was the only black student in his class and remembers having to carry a stick with him during the day to fend off the physical attacks he often faced when the teacher left the room. In 1970, he was joined by his twin sister, Althea Michelle, and 15 other black students. Mr. Espy knows that racist violence is no joking matter. We know that his opponent cannot say the same. 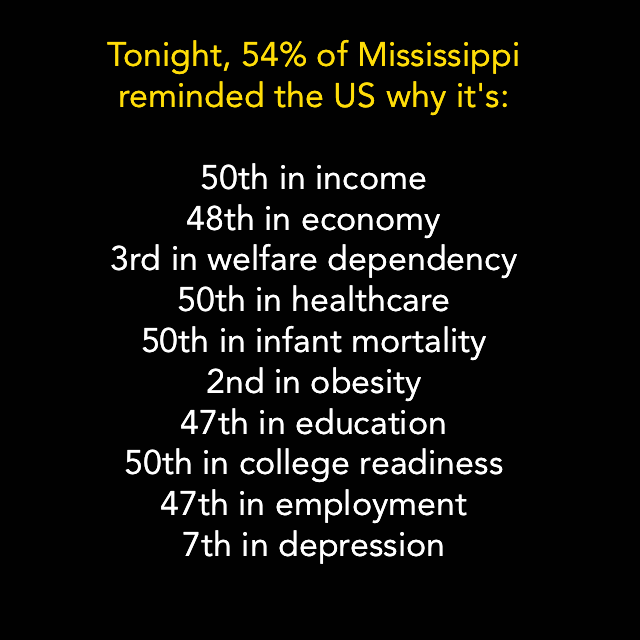 Hopefully, decent people and progressive business will take not of Mississippi's signal to them and choose to avoid the state like the plague. If this happens, the downward spiral and economic isolation of Mississippi will intensify and, hopefully, at some future day Mississippi residents will opt to throw its ugly past and people like Ms. Hyde-Smith on the trash heap. 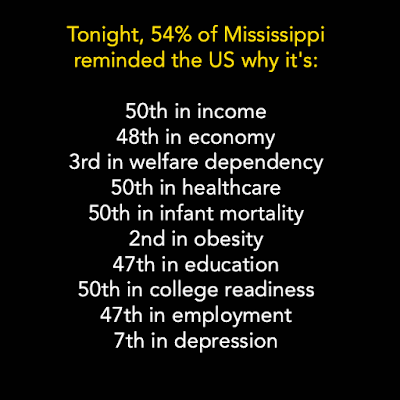 With a life expectancy of 75.0 years, Mississippi is also dead last in life expectancy among American states, between the life expectancy of people in strife-ridden countries including West Bank and Syria and the life expectancy of Salvadorans and Iraqis. For general background, the average American life expectancy is 78.9 years, placing us 43rd worldwide. (What a boast! "We're #43! We're #43!") Not a surprise, the American life expectancy is drawn down dramatically by the dismal statistics from the former slave states of the Confederacy and other states controlled by Republiscum.